If your school-age niece or nephew has been diagnosed with ADHD – attention deficit/hyperactivity disorder – a proven new therapy may be worth a try as an alternative to, or in addition to, medication. The American Academy of Pediatrics guidelines for managing a child’s ADHD states that it important to consider using both psychopharmacological and psychosocial therapies. “The take away from this is that families now have a viable option when seeking alternative or adjunct therapies to medication treatments for ADHD, especially when it comes to impaired attention," said Schuck. "Inattention is perhaps the most salient problem experienced across the life span for individuals with this disorder." 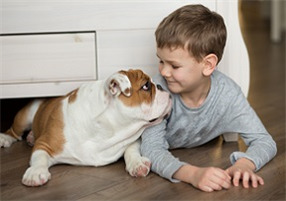 If the parents are willing, a pet dog may be the perfect back-to-school gift for a niece or nephew coping with difficulties focusing in class. University of California - Irvine. "Therapy dogs effective in reducing symptoms of ADHD, study finds." ScienceDaily. (accessed July 23, 2018).